September is when we collect the last tomatoes before they are blighted by damp British weather. I planted mainly one variety this year, the tiny Red Pear, a lightbulb shape in an intense shade of red. In Australia, the harvest is in February when families of Italian origin gather together for a tomato bottling session. The fresh tomatoes are briefly blanched and skinned, then minced either by hand or using a food mill. The tomato pulp is simmered with salt and basil and packed into clean jars. The full jars are pasteurised by putting them in a large saucepan, using tea towels on the bottom to prevent breakages. Fill the saucepan halfway with cold water and bring to the boil for around 30 minutes. Turn off the heat and allow to cool with the jars still inside. Remove the jars when cool and the passata will last the winter. When it comes to tinned tomatoes, San Marzano are probably the best known Italian ‘sauce’ tomatoes, long and juicy in a blazing crimson. Recently I visited the harvest of another type of Italian tomato, Corbarino, grown around a hillside town called Corbara, in the foothills of the Monti Lattari National Park, glittering under the shadow of Vesuvius. 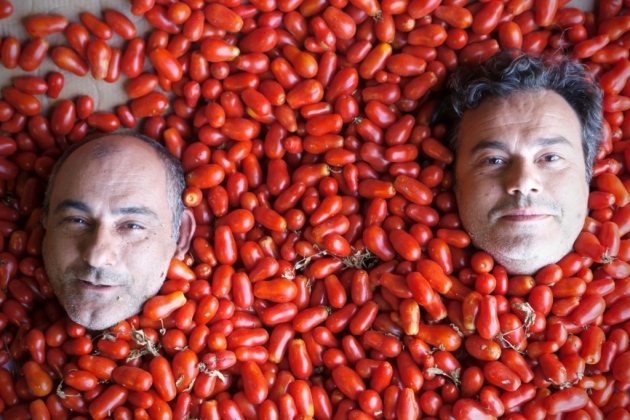 Two friends, Massimo Franzin and Carlo D’Amato, realised that Corbarino tomato cultivar was dying out, grown only by old men in their gardens. Corbarino are small, thin-skinned, and sweet. 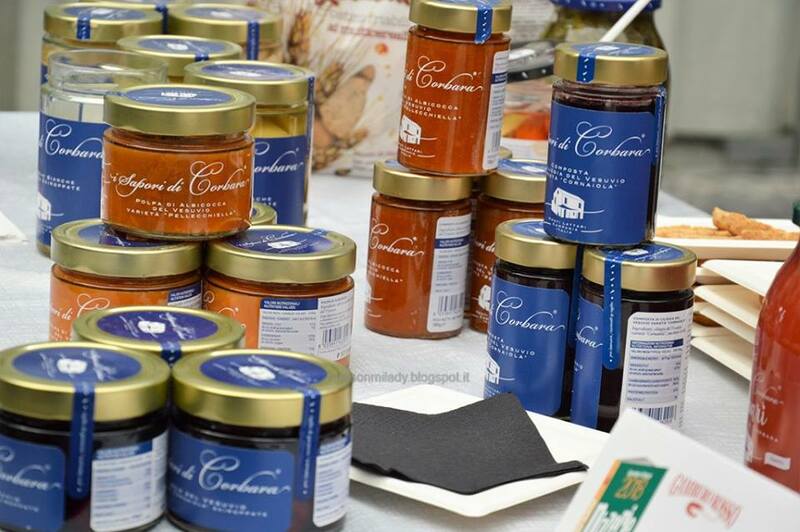 So Massimo and Carlo founded a business, I Sapori di Corbara, encouraging local farmers to grow Corbarino tomatoes again. The tomatoes are picked in the morning, driven to the factory the same day and immediately bottled, retaining the sweetness and freshness of the vine grown fruit. 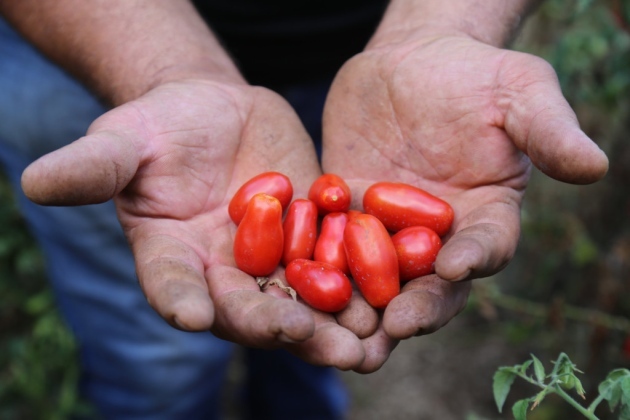 These tomatoes are virtually grown wild, in small patches dotted over the national park, which has volcanic soil, and have no irrigation, only rare rain water, intensifying their flavour. Admittedly they aren’t cheap, costing around £6 a jar. 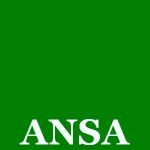 They can be ordered online or for delivery in London at andreasveg.co.uk/products/i-sapori-di-corbara-the-2016-harvest. Both San Marzano and Corbarino have proved, in scientific studies, to fight stomach cancer. Pasta with tomato sauce is ultimately a peasant dish – cheap and quick to make. So why not buy the best tinned tomatoes and the best pasta? 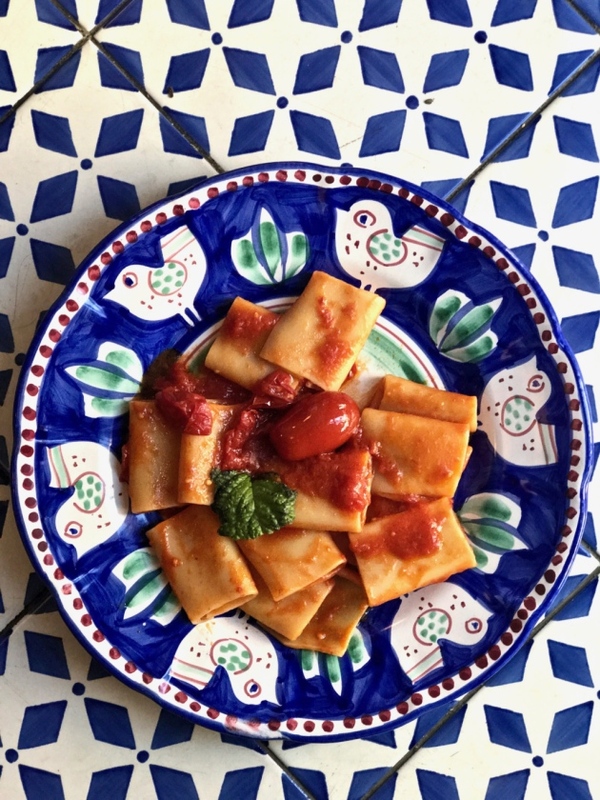 This shape of pasta is particularly popular around Naples and Campania. Often stuffed (for instance with ricotta and vegetables) and served with the tubes standing upright, it’s also delicious with a simple tomato sauce. You can buy paccheri at Waitrose or specialist Italian shops. The advantage of using sweet tomatoes is that the sauce doesn’t take very long to make, just the time necessary to make the pasta. You’ll also want to wipe up every little bit; perhaps the best part of an Italian meal is a ritual – ‘fare la scarpetta’, meaning ‘make the little shoe’, where you use a piece of bread to mop up the sauce. Cook the paccheri in a large saucepan in plenty of boiling salted water. Meanwhile using a deep frying pan on a medium heat, warm the olive oil and bay leaves, then add the tomatoes. Add the garlic, salt and basil. Fry for ten minutes. Drain the pasta, return to the pan, add a splash of olive oil, then add the sauce to the pasta. Serve immediately. In the days before refrigeration, another preserving method for a tomato glut was using the heat of the sun. Sadly, we rarely have the weather to make our own sun-dried tomatoes, but you can dry them in a low oven instead. Sun-Dried: Lay the tomatoes out on the tray, sprinkle over the salt and drizzle the olive oil. Cover with some kind of screen. Leave in the sun for four days. The tomatoes will shrink considerably. 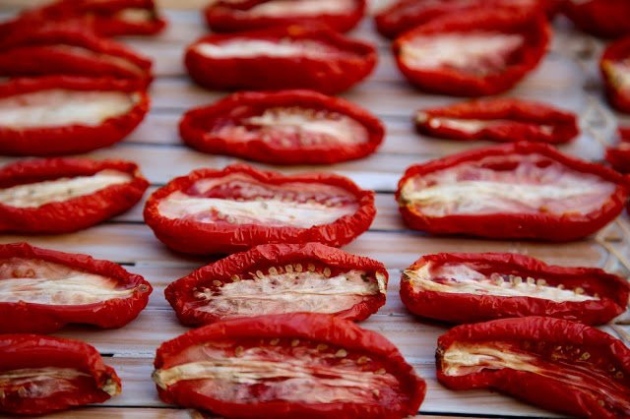 Oven-Dried: Lay the tomatoes, cut sides up, on a rack over an oven tray. 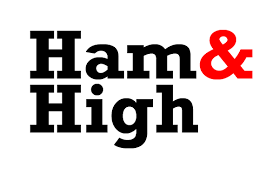 Add salt and olive oil and dry on a low oven (100C) for 3 to 5 hours, depending on whether you want them semi-dried or dried.